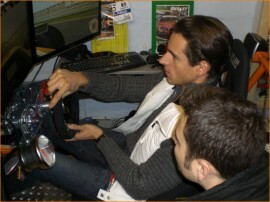 Adrian Sutil will be competing against SK's virtual racing team, among others, to raise money for the Formula Kinderlachen charity event this Saturday. Over 50 participants have already registered with each making a donation of at least 10€, event sponsor BERLET will be donating an additional 5€ for every donation made. The following SK players have been invited to participate in the GTR Evolution race this Saturday, Danny 'HuskY' Engels, Marco 'Jay' Schade, Hendrik 'b0nd' von Eye, Marc 'Toretto' Schreiber, Marcel 'SandMan' Krause, Christoph 'DreaF' H&ouml;renbaum, Bj&ouml;rn 'Biertrinker' Kajewski and Johannes 'jo' Rose. F3000 (Formula Masters) has been selected as the car for the event while Nürburgring GP, Germany has been selected as the track. The event will use the Superpole format which means one qualification lap and after that a 30 lap race. The event will be played online starting with a semi-finals match to whittle the contestants down to 24. The final 24 participants will compete with Adrian Sutil in the final race, for which the German F1 star has been practicing thoroughly. In the spirit of charity, HuskY has uploaded what is normally a closely guarded secret amongst racing players, his F3000 car-setup. GTR Evolution players can download it here. You can follow the final race live in German here this Saturday, January 10th at 20:00 CET. So far over 2000 euro's have already been raised, if you feel like contributing to this charity event then you can use the following details to make a donation. Your donation will go towards helping sick children in Germany.